You probably don’t hear much about scurvy these days. It was very common among sailors a few centuries ago because they didn’t eat adequate vitamin C. Once they discovered that eating citrus fruit would cure the problem, the ships typically took ample lemon juice, oranges, or some other form of citrus to make sure they ate enough vitamin C.
With the cure for scurvy so readily accessible, we didn’t hear about scurvy for a long time. In fact, many people don’t even know about it today. But there are a lot of people who are suffering from mild scurvy and don’t even know it. Here’s how to know if you have this illness and how to fix it fast. And this same easy cure can help you avoid cancer, pneumonia, and even Ebola (and other deadly infections). The symptoms of scurvy are very common. They include weakness, feeling tired, and sore arms and legs. But it can also cause anemia, gingivitis (gum disease), skin hemorrhages, joint and bone problems, eye problems, and even heart and lung problems. That means you could have dry eye, joint paint, or heart problems and all you need to do is take more vitamin C.
But there’s a problem with vitamin C.
If you’ve ever taken a lot of vitamin C at one time, you may have noticed something quite unpleasant. Taking more than 1,000 mg of this fabulous nutrient can really upset your stomach – or worse. 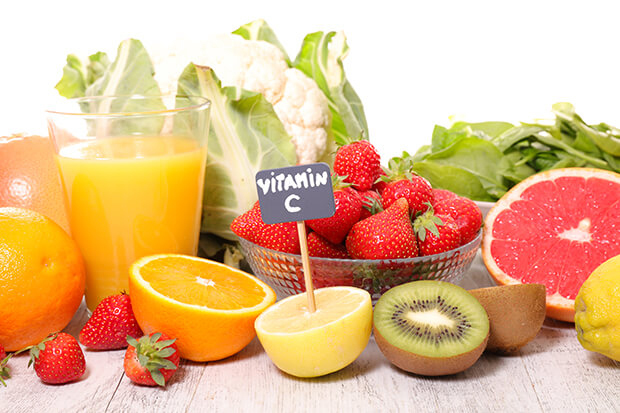 Too much vitamin C can cause diarrhea, vomiting, cramping, heartburn, headaches, insomnia, and kidney stones. This is a problem, because some people need more vitamin C than their stomach can handle. Fortunately, there are two easy ways to remedy this problem. The first way to overcome the digestive upset and still take more than 1 gram of vitamin C is with liposomal vitamin C. Liposomes are double-layer, liquid-filled bubbles made from phospholipids. These fat bubbles can be filled with nutrients and delivered more effectively than normal pills. The structure of the phospholipids is nearly identical to cell membranes in the human body. This allows the nutrients encapsulated in the phospholipids to pass directly into your cells without the normal digestive process. According to vitamin C expert Thomas Levy, MD, JD, liposomal vitamin C is a highly effective way to deliver more vitamin C to the tissues. His research indicates that 90% of the liposomal vitamin C moves into the tissues. So if you take 6 grams of liposomal vitamin C, your body will absorb 5.4 grams of it. What's more, you can take this dose for about $5 per day. If you have any of the symptoms of scurvy or any other major health issue, try taking some liposomal vitamin C. It could solve your problem within a few weeks – and you won’t have any digestive distress. Most people don’t need to take 6 grams a day for a maintenance dose. The normal daily dose (1 gram) should be plenty. If your stomach can handle this dose in the regular sodium ascorbate form, then stick with regular vitamin C. It’s cheaper and works great. But if you notice any digestive distress, consider liposomal vitamin C.
I do recommend having some liposomal vitamin C on hand if you need to take more to fight off a cold or flu symptoms, shingles, and other common illnesses you might encounter. When these acute infections occur, you can take several grams of the liposome-encapsulated form of vitamin C each hour through the day until the symptoms disappear. You can take this in addition to the sodium ascorbate, giving you a double dose to fight the infection. Liposomal C is available at most health food stores and online. One of the problems with oral vitamin C surfaces when the flu develops. It’s often difficult to keep anything down, let alone supplements. But it’s vital you treat the flu with vitamin C. Every year, the Centers for Disease Control tell us how many people die from the flu. Many of these people don't actually succumb to the flu, but to pneumonia. Pneumonia is the eighth ranked killer disease in the world. And most of these deaths come from flu complications that turn into pneumonia. I was shocked when the CBS TV show “60 Minutes” did a special on intravenous vitamin C. This particular show did a segment on the miraculous recovery of Alan Smith of New Zealand. Alan was fighting for his life because complications of the H1N1 virus had given him double pneumonia. To complicate matters even worse, he also had leukemia. Alan was on life support and the hospital staff had given up on him. They wanted to pull the plug on his life support. However, before the family allowed that to happen, they forced the hospital staff to give Alan high-dose intravenous vitamin C. Reluctantly, the hospital tried the treatment. And it worked. After two days of IV vitamin C, his X-rays changed in a big way. Prior to the vitamin C, his lungs were so infected you couldn't see his lungs on X-ray. Two days later, you could easily see his lungs. It was a miracle. But once Alan was able to breathe on his own, the hospital refused to give him any more vitamin C. His health began to deteriorate again. So the hospital put him on low-dose IV vitamin C (1,000 mg daily). It helped, but his recovery was slow. This happened a couple of times, where the hospital would take him off and his health would deteriorate. Then they would put him back on at the family's insistence. Once Alan recovered enough to come out of his coma, the hospital wouldn't give him the IV vitamin C any longer. So the family started giving him oral liposomal vitamin C. After six days on the liposomal vitamin C, Alan left the hospital and went home to his farm. His recovery was truly remarkable. The hospital staff was stunned. The high-dose IV vitamin C was 25-50 grams daily. It was having a dramatic impact. However, 1-2 grams per day had only slow results. But when Alan started taking 6 grams each day of liposomal C, he recovered as fast as he was with the high-dose IV. This is why it’s good to have liposomal vitamin C on hand. Taking it as soon as symptoms appear can help you avoid the flu and pneumonia. Having a doctor that can administer the IV is vital because we don’t always take our supplements when the symptoms begin. It’s also important when superbugs hit. Intravenous high-dose vitamin C is so powerful, researchers have not found one virus that can survive the treatment. The reason vitamin C is so effective is that its structure allows it to move freely throughout the body. This allows it to attack viruses that other, perhaps more-powerful antivirals can't kill because they can't reach the viruses. So will high-dose IV vitamin C work against Ebola? There's every reason to believe it will. Remember, there hasn't been one single virus that vitamin C hasn't inactivated or killed. Vitamin C kills viruses by activating something called “Fenton's reaction.” This is a complex chemical reaction that scientists use in various applications to destroy organic compounds. Think of hydrogen peroxide’s bubble action when you pour it on a cut. With vitamin C, the Fenton's reaction creates the most reactive oxidizing agents science has ever identified. As a result, they're able to radically upregulate oxidative stress, which destroys the virus. What's exciting about vitamin C is that it works on all viruses and all of their various mutations. So if Ebola becomes airborne, the treatment is the same. It's also important to remember that Ebola is doing most of its damage in countries with very deficient nutrition. It’s possible Ebola can survive only in a nutrient-deficient environment, much like scurvy. So keeping your immune system strong will go a long way toward keeping the virus at bay. This is true for most superbugs. I’ve told you in the past that many superbugs really aren’t that strong. They’re just able to survive antibiotics. A strong immune system can usually knock them out. Will vitamin C really help you fight cancer? Just look at what it does for pancreatic cancer. As you may know, pancreatic cancer is usually a death sentence. Most people with this form of cancer live only about five or six months. This prognosis is getting better, but it’s still a very deadly form of cancer. But using IV vitamin C can help you increase your life expectancy. During the study, the patients lost an average of only 11 pounds. That's a lot less than expected. The worst side effects experienced (if any) were mild diarrhea and dry mouth. The vitamin C stopped the progression of the cancer for 26 weeks on average. And they all lived an average of 12 months longer than expected. Two of the participants lived for 15 months. And one, remarkably, lived for 29 months – over two years. That means we might be able to improve this treatment. These results are astounding back then. And with today’s treatments, the outcomes might be even better. Other studies show that IV vitamin C can reduce inflammation markers in cancer patients by 76%. In fact, this same study found that IV vitamin C decreased tumor markers in 77% of prostate cancer patients and 73% of breast cancer patients. So if you have any type of cancer, you'll want to talk to your doctor about using high doses of vitamin C intravenously. It could save your life – or at least allow you to live longer and better than you would with chemo alone. Notice the results in the first study were discovered in patients taking chemotherapy. In his book Cancer and Vitamin C, Linus Pauling suggested that high-dose vitamin C might interfere with chemotherapy. He thought the vitamin would render the drugs ineffective. Oncologists are usually in agreement with this position. But, with only a few exceptions, the evidence is now against it. Studies have found that many patients taking chemotherapeutic drugs and vitamin C experienced fewer side effects. Only a few small studies have investigated the effects of chemotherapy combined with antioxidants in humans. One study in Finland looked at high-dose antioxidants taken together with chemotherapy and radiation. The researchers found that the antioxidants significantly prolonged survival in patients with small-cell lung cancer. Another randomized, double-blind, placebo-controlled Dutch study tested antioxidants in 50 cancer patients undergoing cisplatin chemotherapy. Cisplatin normally damages the ears and kidneys, and patients typically experience hearing loss. Half the group received a placebo, and half took 1,000 mg of vitamin C, 400 mg of synthetic vitamin E, and 0.1 mg of selenium twice a day. The antioxidant supplements did not significantly prevent kidney or inner ear toxicity. But the supplemented patients did have less loss of high-tone hearing. Then, in another study, researchers followed 136 patients with stage III or IV non-small-cell lung cancer. About half the patients took chemotherapy alone; the other half received chemotherapy and daily high-dose antioxidants, including about six grams of vitamin C, one gram of synthetic vitamin E, and 60 mg of beta-carotene. There was a trend toward improved response in those who received both chemotherapy and antioxidants. So if you have cancer, talk to a doctor who administers IV vitamin C and ask them if it would help you while you’re on chemotherapy. Growing evidence suggests it will. Anticancer Research, 1992; European Journal of Cancer, 2004; Journal of the American College of Nutrition, February 2005.